Last week I found myself in Albuquerque, New Mexico on business with a few hours of spare time. 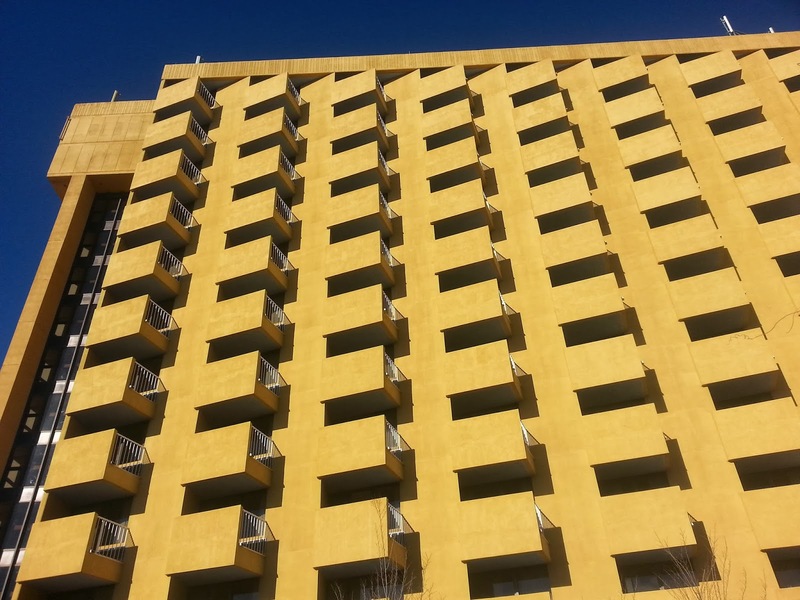 I went exploring and discovered an innate New Mexico modernism– and some unexpected surprises. I picked up my rental car at the Sunport and headed to my hotel. My base camp was the Hotel Albuquerque in Old Town. It was comfortable and, as the name implies, close to the Old Town historic area. My room was on the south side of the building and had a nice little balcony overlooking the courtyard. I asked a couple of people when the hotel was built but never got a concise answer. It had a Seventies vibe but later additions made it hard to tell when the main structure was built. Albuquerque offers history nerds a wide variety. The city was founded in 1706 as a Spanish outpost and their influence is evident everywhere. Contrast this with the Fifties kitsch of Route 66 and the Streamline modernism of the Nob Hill neighborhood. Travel west an hour and you can turn the clock back even further– the Acoma Pueblo is the oldest inhabited community in America! All told you have a potpourri as varied as the seasonal temperatures. Travel Footnote: We enjoy visiting the Land of Enchantment, although Jackie has a terrible time with the arid climate. With humidity levels in the 15-25% range it's important to drink plenty of agua– and maybe even bring along a humidifier! ABQ has one of the best designed rental car shuttle systems I've seen at any airport. All agencies are located in the same building and a shuttle bus whisks you there in about 5 minutes. I've also discovered the last thing you want to do is reserve a car far in advance. It seems counter-intuitive, but unlike booking flights, waiting until the last minute gets you the best rental car rates. I pulled up my Expedia.com app a few days before departure and paid a whopping $8 a day. The taxes were higher than the rental fee! I headed off primarily searching for filming locations used in the AMC television series Breaking Bad. Along the way I discovered some amazing sites that had nothing to do with Walt or Jesse. Here are a few notable stops you might enjoy also. I've also included a slideshow below with more photos from my visit. 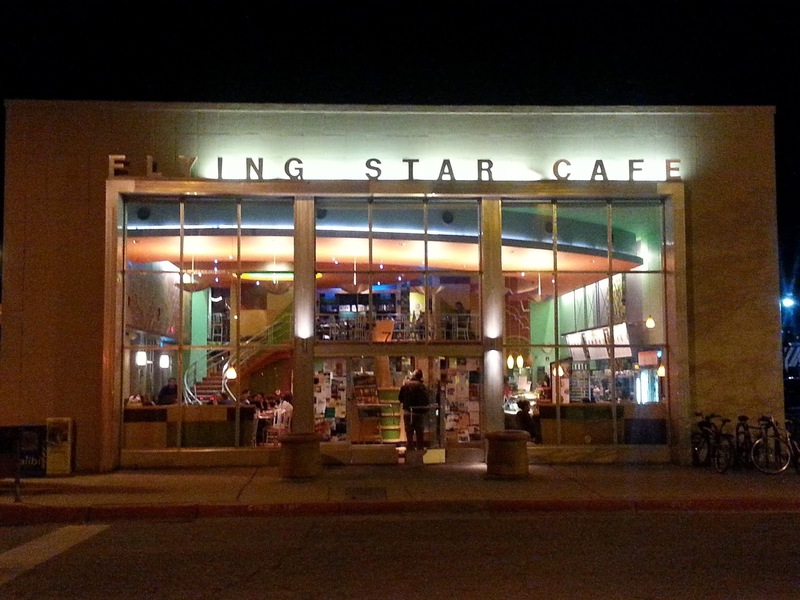 Flying Star Cafe— This chain operates several restaurants in Albuquerque and Santa Fe. They all appear to be pretty cool looking, but the one in downtown Albuquerque is a star not too be missed. Originally designed in 1949 by John Gaw Meem for the Southern Union Gas Company, the International style building was renovated in 2005. This was the first impressive stairway I discovered in New Mexico, a sweeping aluminum affair that once showcased the latest gas ranges. Today the interior has a Deco vibe with colorful walls and a tiered ceiling. Oh... and the food is great too! Albuquerque International Sunport Museum— After your flight lands linger upstairs in the airport before your baggage arrives. 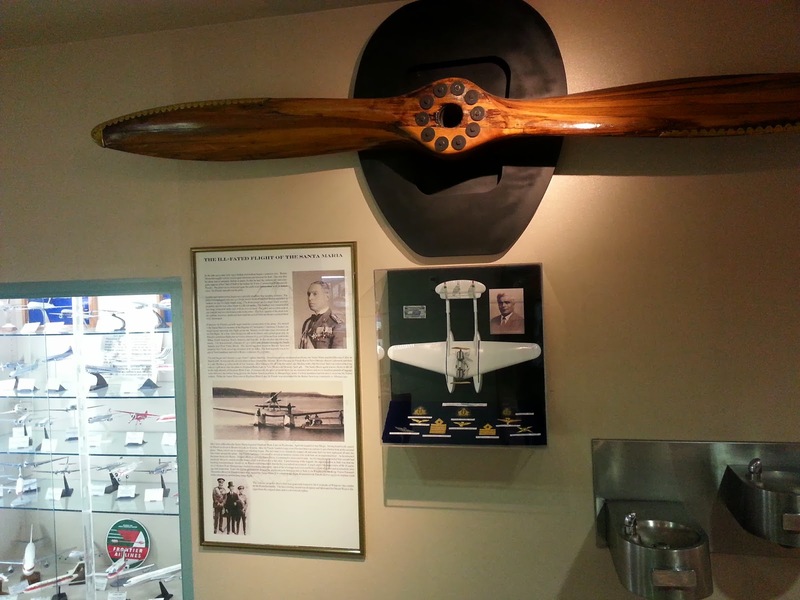 On the wall near the main escalators you'll see an artifact from a little-known chapter of aviation history. An era when fascism was popular and an Italian flying boat visited New Mexico. In 1927 a specially modified Savoia Marchetti S.55 set off from Sardinia to circumnavigate the world. Unfortunately the high altitude of the lake where Francesco De Pinedo landed made it impossible for him to take off with a full load of fuel. They discarded whatever non-essentials they could find- and the wooden propeller hanging on the wall happened to be a spare. Model Pharmacy— Located in the trendy Nob Hill area this little treat is a great place to stop for lunch or just a malt. The triangular building dates from the Forties and features a classic soda fountain. The menu at the Model Pharmacy includes deli sandwiches, ice cream sundaes and plate lunch fare. While waiting for your malt you can conveniently pick up any salves, tinctures or perfume you may need for your travels. Architecture fans will want to walk a block southwest on Monte Vista street to ogle a Bart Prince house. 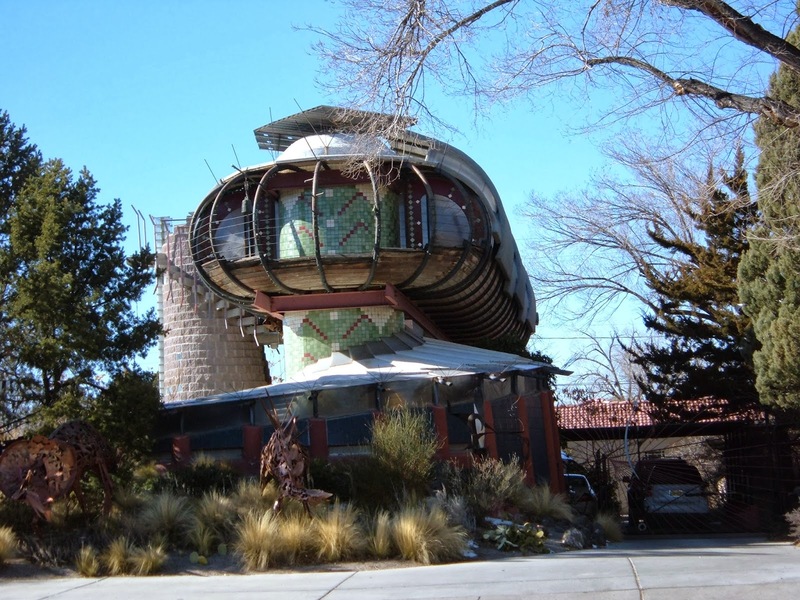 It looks like a shuttle from the starship Enterprise landed on top of a Bruce Goff house! International Balloon Museum— Obviously I'm a bit of an aviation nut (see above). Jackie was a little hesitant when I suggested we visit a balloon museum, but the museum building is very modern and, not surprisingly, shaped like a balloon! The main focus of course is hot air balloons, like those seen filling the skies over Albuquerque in their annual festival. But there are also exhibits on blimps, zeppelins (or should I say dirigibles?) and weather. We thought the rare Japanese balloon-bomb was especially interesting. Century Square Antique Mall— Located on Central Avenue amongst several second-hand shops, this unique building is a gem. If the simple Mid Mod exterior doesn't woo you just wait until you step inside. 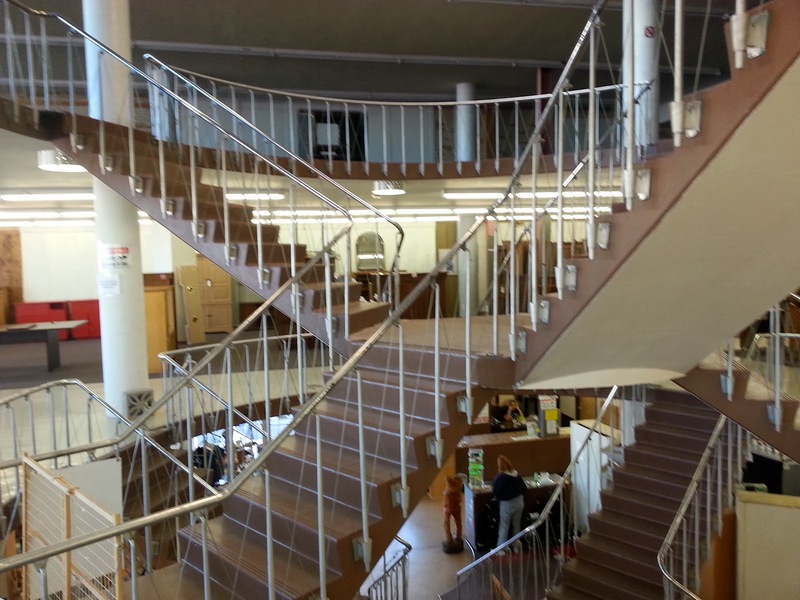 The staircase is one of the most unusual I have ever seen! It was originally home to White's, a catalog store similar to Montgomery Wards. The three-story showroom features an open mezzanine up front with space-age hanging lamps. The central stairs lead to a domed ceiling with round skylights. The alloy handrails and zig-zag cable accents are so intricate I found it difficult to fully capture the zany geometry of this gem! Gruet Winery— I never even knew they grew wine grapes in New Mexico, but they do! Tucked between an RV lot and portable building store is some of America's finest champagne (or whatever you call it since they obviously aren't in Champagne, France). But don't let the unlikely location fool you- this French family's Gruet wines and less expensive Domaine Saint Vincint bubbly are award-winners. We discovered this place back in 2008 and have enjoyed them ever since. Oh... and say it grew-AY. Stop in for a sample tasting or buy unique varieties not available in stores. 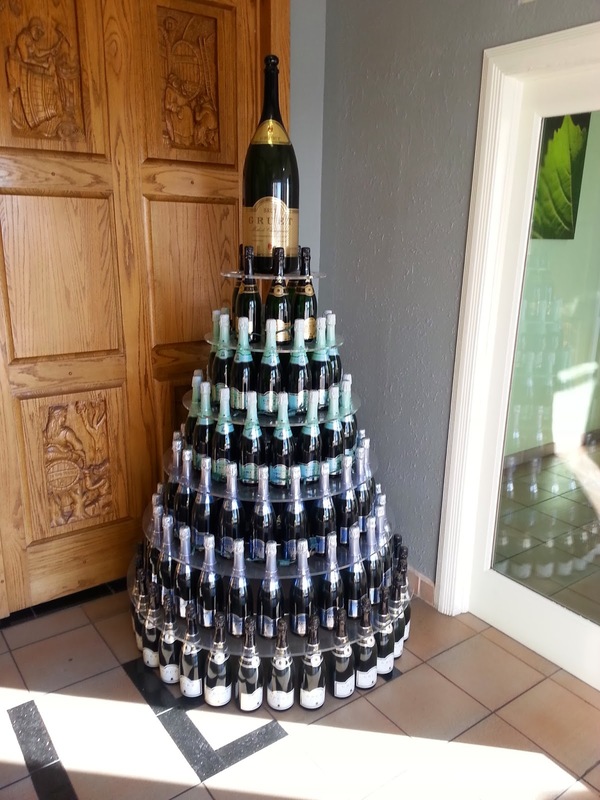 You can even order online at www.gruetwinery.com. Central Avenue at Night— And finally here's an easy one: Wait for the sun to go down, go drive down Central. Easy! Albuquerque has a wonderful collection of beautiful neon signs and the best place to enjoy them is along the old route of the Mother Road.